NEW YORK (WABC) -- With President-elect Donald Trump set to take office amid vows to repeal and replace Obamacare, many who are covered under the program are fearful over losing their coverage. Wellington Pellerano found out he was sick with stage 3 Hodgkins lymphoma in October. He has Obamacare now, but like so many New Yorkers, he lost his previous insurance as soon as doctors mentioned the word cancer. "I had (insurance) for three days," he said. "I was hospitalized. Three days later, I found I didn't have insurance no more." Whether he planned it or not, Mayor Bill de Blasio is becoming the president-elect's number one opponent, vowing a fight over the plan to repeal and replace the health care program. 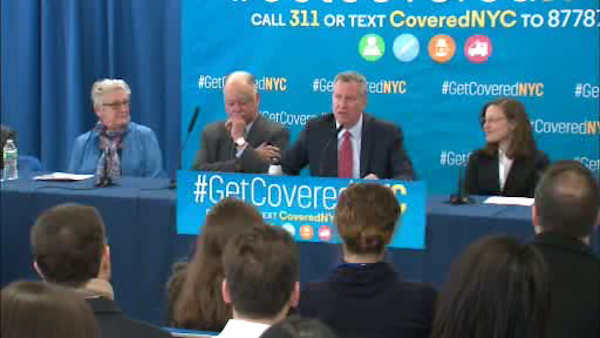 On Tuesday, de Blasio launched a program called Get Covered NYC!, an outreach program that will go door-to-door throughout the five boroughs. Volunteers speak everything from Cantonese to Spanish, letting residents know the good that Obamacare can do for them. The mayor wants to get 50,000 more New Yorkers enrolled in Obamacare as soon as possible, with the reason for the big push being that once someone already has insurance, it will be awfully hard for Congress to try to take it away. "Of course we're going to fight," de Blasio said. "What's our alternative? Let our people have their insurance taken away from them? One-point-six million people robbed of their health insurance, we would never accept that." De Blasio is pulling together a team to fight Trump that includes HIV-positive City Councilman Corey Johnson, who asks the question, if not Obamacare, then what? "I am furious," he said. "This is immoral. This is insane. People should not lose their health insurance. This is a life or death issue." And it is certainly life or death for people like Wellington Pellerano. "I'm good," he said. "I'm great. That's one less thing I have to worry about."